Pop culture fanatics love to pit two iconic fictional characters against each other in a theoretical battle to the death – an assertion last weekend’s box office numbers certainly support – and one of the most oft-used contenders is Ash Williams, the Evil Dead hero brought to manic life by Bruce Campbell. It’s obvious why he’d be such a fan favorite to use, and the actor is not only aware of the concept, but he also champions it. Here’s how the veteran actor says the deadite-dropping Ash would fare against The Walking Dead’s mega-popular Daryl Dixon. Ash would defeat Daryl by throwing a bottle of shampoo at him. He'll be so amazed at something he's never seen before, he won't even know that Ash has cross-bowed him in the spleen. Da-a-a-a-amn. 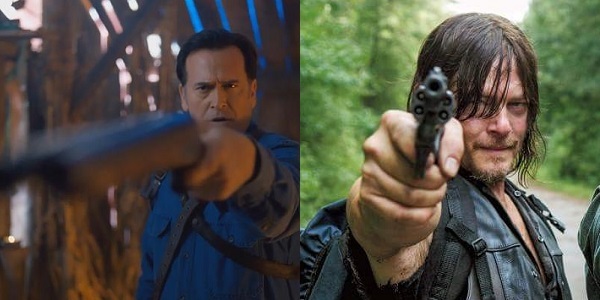 The only way Bruce Campbell could have slammed Daryl any harder would be if he used Negan’s bat to swing the Necronomicon right into his face. That was arguably more brutal than what actually happened to Daryl at the end of the last episode. First, Campbell goes for Daryl’s hair, a subject of much contention over the six seasons of The Walking Dead. It used to be kept short and, while possibly not clean, at least not as grimy (not Grime-y) as it is now, and Daryl really is the kind of guy who would probably “bathe” by wiping himself with wet leaves rather than using Alexandria’s hot water for a shower. And as evidenced by his often bloody coif on the spectacular Ash vs Evil Dead, Ash knows a thing or two about keeping up appearances in the face of danger, so he’s justified in using Daryl’s hairdo against him. And then, to add insult to injury – or to use an insult to cause an injury, as it were – Bruce Campbell predicts that Ash would put Daryl out of his misery by shooting him with his own weapon, the crossbow. Daryl just got his baby back, too, and already Campbell is talking about stealing it again and then ending Daryl’s life with it. Oh, the humanity. This isn’t the first time that Bruce Campbell has taken a crack at adding himselfto the Walking Dead universe, saying he’d have taken care of everything before Rick even woke up from his coma. Probably only had to use his boomstick once, too. Ash vs Evil Dead will return to Starz for what will likely be a glorious Season 2 this fall, with Lee Majors joining the cast as Ash’s father. Meanwhile, The Walking Dead is gearing up for its intense Season 6 finale on Sunday, April 3, on AMC.